Home> Resource> Android Backup> How to Download & Install MobiKin Assistant for Android (Android Version) to My Android Device? To connect MobiKin Assistant for Android, Transfer for Mobile or Eraser for Android via Wi-Fi, downloading and installing MobiKin Assistant for Android (Android Version) to your Android phone is necessary. But it doesn't matter since this is an easy task and you even have several options to complete the process. Below are the details. Installation: How to Install the Downloaded App? Step 1. Connect your Android phone to a stable network and then open the default browser on your device. Step 4. Once the scanning process ends, you can click "Download" > "Save" to download the App to your Android. Step 1. Turn on the browser on your mobile phone and then input the website address: a.mobikin.com. Step 2. Click on the "Free Trial" icon after entering the page to download the App. If you are visiting this page on your mobile phone, you can directly click the icon below to download MobiKin Assistant for Android (Android Version) to your device. Notice: After downloading the App, you need to change the security setting on your mobile phone by clicking "Settings" > "Security" > "Unknown sources" > "Allow", so the application can work normally on your device. Step 1. Simply hit the "Install" button and wait till the installation ends. Step 2. Slide the buttons next to Camera, Contacts, Phone, SMS, etc. and click on "CONFIRM" to grant App permissions. Once done, you can connect the software via Wi-Fi or use the App to manage your phone data. 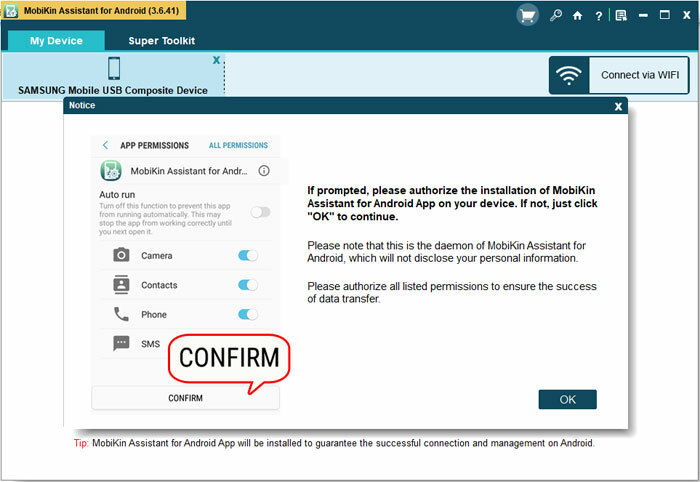 Tips: If you select to connect the program via USB cable, you do not need to download and install the App manually - during the connection, the program will download and install the Assistant for Android (Android Version) on your Android device automatically. In this case, you just need to turn to your mobile phone and authorize the installation when the following interface pops up. - What's your Android device? - What's your Android OS version? If you have other problems about the software connection, recognition, installation or use, please go to the Product FAQ page to find the solutions.